Japanese language students are lucky: There’s so much competition for Japanese learning materials that the quality of Japanese textbooks out there are extremely high compared to some other less-pursued languages (even compared to Korean for example). In the 10+ years I’ve been studying Japanese, I have bought piles and piles of Japanese language books, always with the idea of looking for the one to rule them all. In the end, no textbook is perfect: all have their strengths and weaknesses, but there are clearly some that are exceptionally well thought out, and will help you get you the best ‘bang for your buck’ in your Japanese study. 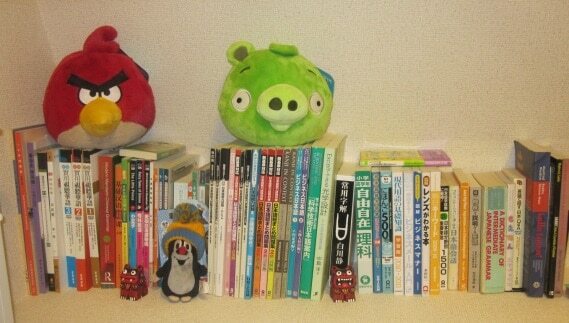 Without further ado, here are the 10 best resource books we’ve found for Japanese self-study. If you took Japanese in University, this is probably the textbook you used. And love it or hate it, it’s still probably the best beginners Japanese textbook out there. There are no shortcuts with this textbook — you have to put in the time to learn and absorb the material. If you can work through to the end of this textbook, you’ll the necessary foundations of vocabulary, grammar, hiragana, katakana, and some basic kanji to build on. Conversation / Grammar focuses on learning vocabulary, sentence structure and culturally useful expressions via studying dialogues. Reading / Writing focuses on teaching you kanji and reading comprehension via lessons that correspond to the Conversation part of the book. Overall, while the Genki series still has some flaws that other textbooks have (for example, it teaches ‘Sayonara’ for ‘goodbye’, which isn’t very commonly used day-to-day in Japan), it’s still the best book out there to start learning Japanese on your own. If you get Genki, we also recommend you get the workbook too. There’s a reason why this book is known as the “Yellow Book” or “The Bible” among Japan expats. It is probably the best Japanese learning resource I have ever come across. Clearly and thoroughly written with great example sentences. If you are at a more advanced level, check out the “Blue” and “Red” books by the same authors. In this book James Heisig applies his mnemonics method to learning to read and write the Japanese writing systems of Hiragana and Katakana. I found it really helpful when I was starting out. This has to be the best Japanese-English dictionary in print form. Kodansha really gave a lot of thought to the layout and functionality of this dictionary — and it shows. This furigana dictionary is a must-have in the library of any serious Japanese learner, from beginner to N1. Heisig’s Remembering The Kanji is an invaluable book for mastering kanji, and this book should be required reading for all serious learners of Japanese. My personal anecdote about this book: I struggled terribly with remembering Kanji before I came across this book years ago, and it helped me immensely. Although I’ve forgotten many of the mnemonic ‘stories’ I first learned, I still remember the meanings of most kanji. Some people report not being able to view kanji stroke order on the kindle version. Buyer beware! So this is another kanji-related book. Kanji in Context allows you to build a strong vocabulary after using Heisig’s book. This is the best kanji reference dictionary that I’ve come across. The newest edition has the most common 3000 kanji, in a book that almost could fit in your pocket. An invaluable resource. This book is aimed at students who already have a good grasp of Japanese and want to be able to sound, well, smarter by building their vocabulary with intelligent sounding words. If you’re looking for words and concepts that would impress a native Japanese with your ability, this is probably the one. Recommended for N3 or above (not lower). Ok, so not really a serious one, but you’ll definitely have a lot of laughs with it! Not strictly a book, but it’s a great audio course for starting out in Japanese. Gets a bit too corporate for my liking towards the end of the 3rd series, but you will remember and be able to use what you learn with Pimsleur. You can sample Pimsleur Japanese for free with a Audible 30 day trial. Download the taster course here. A lot of people hate on Pimsleur (Why??? ), but it’s really good for beginners to get you speaking. Try it out if you’re just starting Japanese! This is not a ‘book’ per say, but flash cards. Kanji study cards that accompany James Heisig’s Remembering the Kanji (above). It is definitely nice having all 2048 kanji with their readings in one set and it saves you the effort of making the cards/notes yourself. If you’re lazy like me it’s a no-brainer! So there you have it. There are probably more (I have spent a lot of money on Japanese books over the years) but those are the books that stood out for me. Enjoy! Update: We have since posted up some more helpful books for studying Japanese. Check them out here.